Okay so I finally bit the bullet and downloaded this book to my kindle. I just couldn’t take it anymore and had to see what all the fuss was about this Marie Kondo person. To be honest the title of this book really didn’t grab me at all. I thought what’s so magical about tidying up? Just clean up your house and be done with it. Nothing magical about that. Oh how wrong I was. As Marie takes you through the steps of organizing, storing and ultimately decluttering your home, you can’t help but feel an awakening of sorts. My own process of cleaning and decluttering my home consisted of emptying out all dresser drawers completely and going through each article of clothing and selecting what stays and what goes. I smugly thought, phssshh, I could have written this book with my hands tied behind my back since some of the steps Marie explained sounded very familiar as I was already implementing them in my organizing routine. Anything I wanted to keep would get folded and put back in the drawer and anything I didn’t want would go in a pile designated Yard Sale. Whatever was leftover from the yard sale I’d load into my car and haul it off to the Goodwill. But Marie tackles clutter a lot differently than I do. One would think her primary goal in life is to empty out her clients homes and leave them with nothing more than a bed and the clothes on their backs. Not the case at all. She merely explains her rationale on why certain things need not hold a space in your home a minute longer than it should. Holding each piece of clothing, book or trinket in your hand and determining if the item sparks joy is the question you should ask yourself. If the answer is no, then it gets placed in the discard or donate pile. This goes for all the bedrooms, closets, bathrooms, kitchen, and cabinets in the home. While some of her reasoning on why some things should get discarded may seem a bit extreme, I totally get her point and simply can understand her passion for organization and having a clutter free, calm and peaceful home. Though I doubt I’ll be tossing out any articles of sentimental value anytime soon…lol! Since reading this book I have to say it has completely changed how I view things in my home. I’ve held on to stacks of books for so long with the intent of one day getting around to reading them and the same with a few dresses that I bought and planned to hem (I’m really petite) but after several years I just never got around to it. The truth of the matter was that every time I saw those stacks of books on my shelf or those dresses hanging in my closet, I felt guilt and unhappiness and to be honest I always let out a big sigh because they were reminders of my perpetual problem with procrastinating and my lack of commitment to accomplishing things I said I would but never did. As I went through the books I found they no longer interested me and the dresses hanging in my closet were out of style and no longer something I wanted to wear. They didn’t spark joy. So I donated them to the Goodwill. 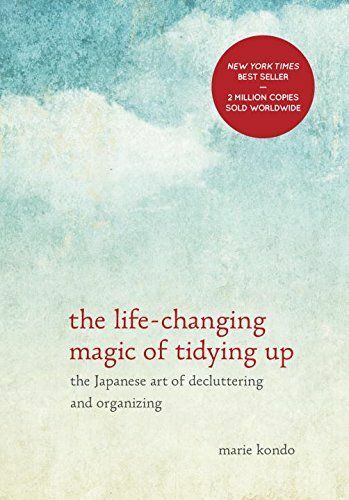 In closing, what I thought was a silly book (because of the title) and only purchased it out of curiosity after reading all the great reviews, I quickly swallowed my words and can honestly say that Marie Kondo’s book The Life Changing Magic of Tidying Up was indeed life changing for me personally. While I have yet to finish my entire home by using her famous KonMari method of simplifying, organizing and storing, I did complete my bedroom and half of my kitchen. Still a work in progress but definitely going in the right direction thanks to this #1 New York Times Best Selling Japanese guide to decluttering. It has definitely earned a spot on my book shelf. Happy reading, ya’ll! I recently read this and found her perspective solid. I am in the process of going through my home. It was impossible to do this one go. So I am embracing the key…keep and surround youself with what brings you joy, the rest is a millstone…but doing it in stages. I saw this book and was wondering about it. Thanks for posting this!